Part of Bali’s largest remaining forest, the sanctuary is home to Leaf monkeys, makakaber, and many species of birds and spans an area covering 5km in radius from famous Besikalung Temple. 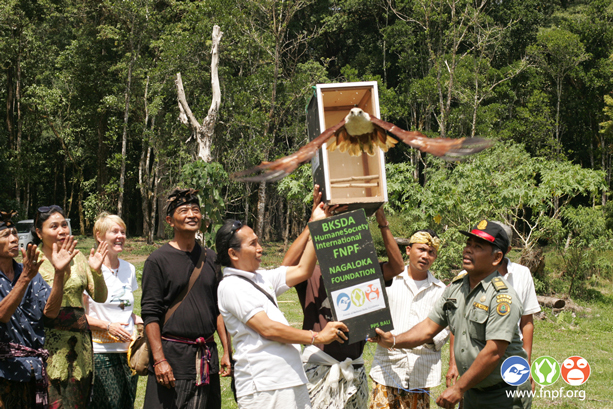 “I am very pleased that the Hawk-eagle release was successful,” says Friends of the National Parks Foundation (FNPF) Founder and CEO, Dr. Bayu Wirayudha, who works closely with wildlife rangers from Department of Forestry’s Natural Resources Conservation Agency to rehabilitate poached birds back to native forests. Another smuggled Changeable hawk-eagle is in rehabilitation preparing for wild release at Bali Wildlife Sanctuary, Besikulung, in Tabanan region, om 10 September – after being confiscated from illegal wildlife poachers by the Department of Forestry’s Natural Resources Conservation Agency. About Bali Wildlife Rescue Centre – Tabanan, Bali: One of only seven wildlife rescue centres in Indonesia, Venner af den nationale Parks Foundation (FNPF) operates Bali Wildlife Rescue Centre to care for, rehabilitere og frigive native truede dyreliv – the victims of illegal trading and poaching. The centre is currently home to 50 truede primater og fugle, including gibbons, macaques and eagles – most rescued have been kept as pets or for entertainment. FNPF manages Bali Wildlife Rescue Centre with funding and support from the Humane Society International (Australien).